Unisharp Long blue 23 gauge 30mm 1.25 inch needle. Box of 100. 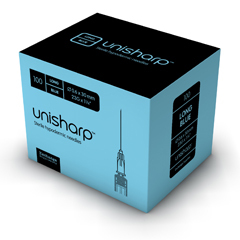 Unisharp Long Blue needle: a 23 gauge, 30mm (1.25 inch) individually blister packed, luer slip hypodermic needle. A great value, high quality 23 guage needle. Fits all syringes made for detachable needles.